In this exercise, we will go through the process of deploying a simple VDI, using Windows Server 2008 R2. We will be supporting dedicated virtual machines for our end users. Microsoft refers dedicated VMs as personal virtual desktops. Before you begin setting up VDI services, review Figure 29, which explains servers required as part of the deployment and how users connect to virtual desktops using the solution. Figure 29. Remote Desktop Services and Hyper-V VDI solution. The first step we need to perform is to set up the proper role services on the server that will host the VMs. We will be adding the Remote Desktop Virtualization Host role service. By installing this role service, Hyper-V will be installed as a required component. Prior to installing Remote Desktop Virtualization Host, you will need to ensure that your server hardware supports Hyper-V.
Open Server Manager and select the Roles node. Then click the Add Roles link. This will launch the Add Roles wizard. Click Next to continue. Select the Remote Desktop Services role. Then click Next. On the Remote Desktop Services Introduction page, click Next to continue. Select the Remote Desktop Virtualization Host option as seen in Figure 30. You will be prompted to add the Hyper-V role services. Click Add Required Role Services. Then click Next. Figure 30. 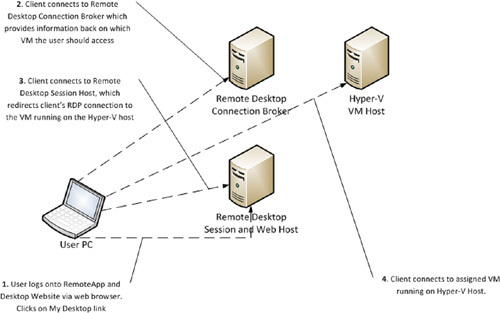 Remote Desktop Virtualization Host Role Service. Click Next at the Hyper-V introduction page. 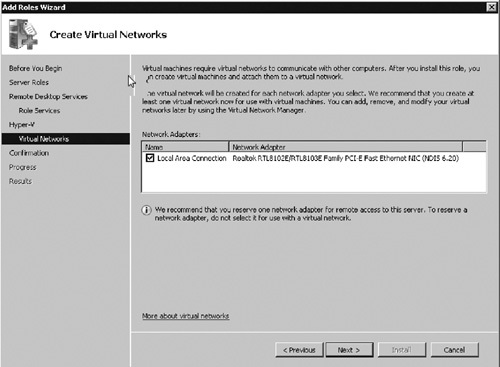 Select the network adapter to use for the virtual network (see Figure 31). Then click Next. Figure 31. Select Hyper-V network adapter. On the verify settings page, click Install. Then click Close. At the restart prompt, click Yes to restart the computer. After the computer restarts, the Resume Configuration Wizard will complete the installation of Desktop Virtualization Host with Hyper-V. After the wizard completes the installation, click Close. Next you will need to create a new virtual machine for each desktop you want to provide to users. If using dedicated desktops, each user will need his or her own VM. If using pools, you will need enough VMs to support the maximum number of concurrent usersFor Virtualization Host Services to work properly, the VM needs to be labeled in the Hyper-V interface using a fully qualified domain name, for example, win7vm.syngress.com.